Is America’s Forgotten Flyover a Gold Mine for Publishers? Traverse City is a bayside town of 15,000 people — the largest city in the 21 counties of northern Michigan. But the community has cultivated cosmopolitan appeal with a lively arts community that includes a major film festival founded by Michael Moore, the celebrated City Opera House, and an outsized literary culture heralded by the National Writers Series. NWS spotlights authors, journalists, and other storytellers in monthly one-on-one conversations that are successful enough to make northern Michigan a prime venue for any author’s book tour; it has been known to draw up to 700 people to events, charging $20-25 at the door (discounts for educators and students). At the same time, it spearheads a multi-platform media blitz for each visiting author. The current NWS season includes conversations with Jodi Piccoult, Alan Cheuse, Michael Sandel, Anna Quindlen, and Natalie Bakopoulos — more women are intentionally featured to balance the many male authors in last year’s line-up. 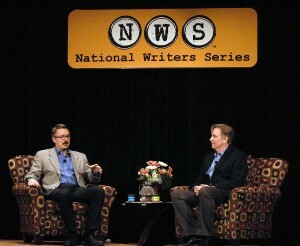 Founded in 2009 by Doug Stanton, himself a bestselling author, NWS calls itself “a year-round book festival” that’s dedicated to enlivening the connection between readers and writers – even as some have left the book tour for dead. Why Start a Writer’s Series? Stanton was himself on a book tour in 2009 when he noticed “dramatic changes” between it and his previous tour. 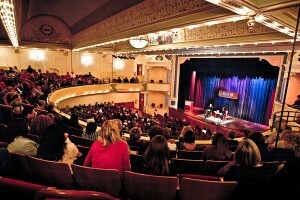 “I asked around the country was working at book events…I heard that cookbook authors have the greatest success turning out audience, and it’s because they’re doing something other than reading and giving lectures.” He also learned that it costs about $2,500 to send authors to each city – which he understood to mean that each city needs to serve authors on what can be a long and lonely trip, both in terms of giving them a great turnout and the amplification that comes with media coverage. “It got much bigger much more quickly than I thought,” Stanton said. He added that NWS is not a day-job for him; he volunteers his time, though NWS now has a small staff. This comes, of course, as literary media has been painfully downsized. Book reviewers fired, radio producers fired … or doing three jobs. Stanton noticed all this from his own book tour experience. Straddling his lives as a writer and as the organizer for one of the nation’s leading literary series means that Stanton offers NWS authors unusual empathy as they work to sell books and connect with readers. But it also means that his own writing habits are changing – and not just because he has less time at the keyboard. Ford returns the compliment, calling Stanton an “extraordinary writer” who happens to be able to do the work of an arts administrator. He said that “socketed away in a rural, out-of-the-way place,” NWS curates a vivid literary culture that treats authors well and serves readers. Marlena Bittner, publicity director at Little, Brown, sent David Sedaris to NWS (“he adored it”). She said NWS is revealing a market that publishers haven’t been connecting to. “There’s an entire market ignored. Readers aren’t just in huge publishing cities,” she said. “There are certain core markets we go to again and again, and we very rarely diverge from that.” She said that her authors return regularly to Tattered Cover Book Store, a Denver bookseller, because they consistently have fantastic experiences there. But Bittner’s reminded of readers living in areas without a leading bookseller — including her own hometown in Pennsylvania, which lost its core bookshop when Borders closed. “But there are still readers there, intelligent people who want to engage with writers,” she said. Anna Clark’s journalism has appeared in The Guardian, The American Prospect, Grantland, and other publications. A 2011 Fulbright fellow in creative writing, Anna edits the literary blog Isak and is a writer-in-residence with the InsideOut Literary Arts Project in Detroit. She can be found on Twitter: @annaleighclark. DISCUSS: At $2,500 to Send an Author to Speak, is it Worth It?